Selected presentations from the 2016 International Symposia on Jesuit Studies series are available in Open Access in Brill’s Jesuit Studies series. The symposium, held in Nairobi, was hosted by Jesuit Historical Institute in Africa (JHIA) in collaboration with the Institute for Advanced Jesuit Studies. The event was the second annual gathering of scholars organized by the Institute for Advanced Jesuit Studies, which is also responsible for presenting this volume in Open Access. The symposium examined the history of Jesuit and Protestant encounters in Africa. Keynote addresses were delivered by Festo Mkenda, S.J., of JHIA, and Robert Maryks of Boston College. These essays serve as the published book’s introduction remarks. The volume’s table of contents appears below, with links to where each contribution may be downloaded at no charge. The full text of the volume may be also downloaded at no charge. 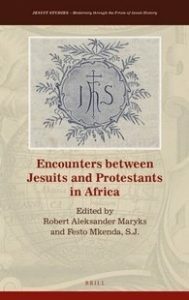 Jesuits, Protestants, and Africa before the Twentieth Century, by Festo Mkenda, S.J. A Protestant Verdict on the Jesuit Missionary Approach in Africa: David Livingstone and Memories of the Early Jesuit Presence in South Central Africa, by Festo Mkenda, S.J. Jesuits and Protestants in South Africa, 1685–2015, by Anthony Egan, S.J. Encounters between Jesuit and Protestant Missionaries in Their Approaches to Evangelization in Zambia, by Choobe Maambo, S.J. Jesuit Portraits of Protestant Missionary Activity in Southern Africa in the Nineteenth and Twentieth Centuries, by Wilfred Sumani, S.J. Jesuits and Protestants in Nineteenth-Century Madagascar, by Jocelyn Rabeson, S.J. Jesuit–Protestant Encounters in Colonial Congo in the Late Nineteenth Century: Perceptions, Prejudices, and the Competition for African Souls, by Toussaint Kafarhire Murhula, S.J. The Adulteresses Were Reformers: The Perception and Position of Women in the Religious Fight of Fernando Po, 1843–1900, by Jean Luc Enyegue, S.J.